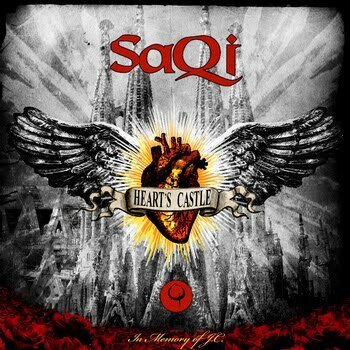 The latest release from saQi is a a 5-track EP called Heart's Castle. Released in May 2010, the album features vocalists: Kyrstyn Pixton, Luz Alena Mendoza, Christopher Worth, Cohen, Leslie Kernochan and additional musicians: Russel Scott & Chet Lyster. Album artwork by: Dee aka "Sweet Anomaly." Stand-out tracks include Cancion del Corazon featuring Luz Alena Mendoza on vocals and some of saQi's signature trumpet over raw guitar work. Twilight In Bardo (Remix) featuring Kyrstyn Pixton is another of the highlights. Kyrston also lends her vocals to the title track, which itself is an amazing body-moving trip through a mix of emotions. As stated in his dedication to his late father, Heart's Castle is an offering from the heart, and it speaks on many levels to those going through love & loss, reminding us of how great it is to feel the whole spectrum of emotions. The 5-track EP is available for $5 at bandcamp.com. Click here to preview and download tracks from Heart's Castle.